I was tweeting and facebooking about my favorite looks on the red carpet at Sunday's SAG awards. There were so many trends. Lots of red, pink and combining the two together. White was a huge trend as well. 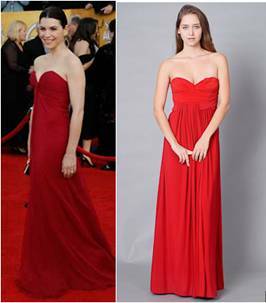 I found some great look-alike finds for the PrivyDoll on a budget that wants to achieve these red carpet looks. All of these great Privy finds can be found on http://www.edressme.com/. Claire Danes looked girly and beautiful in this gown on Sunday. Achieve this same look with this dress for only $358.